Whenever my friends decide to come visit me, they always question the layout of my bedroom. 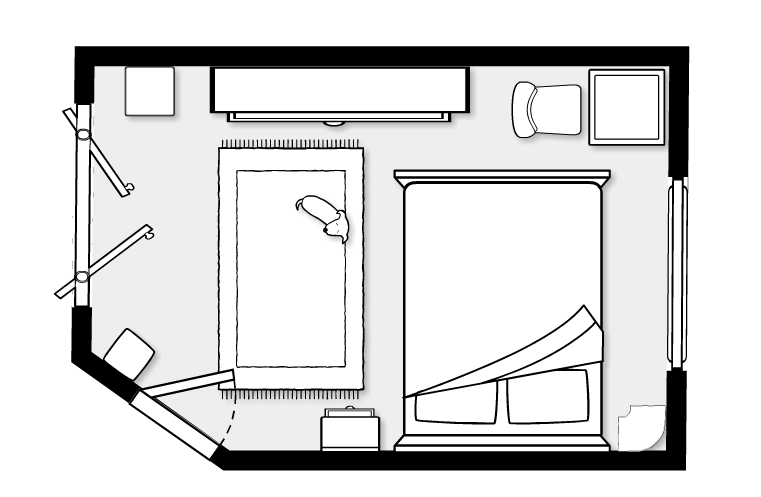 My room is particularly an odd shape when compared to their bedrooms because most standard bedrooms do not have a corner cut off for an entry (as seen in the layout), its usually a full rectangle or square shape. The reason behind the set up of my bedroom is due to space potential. 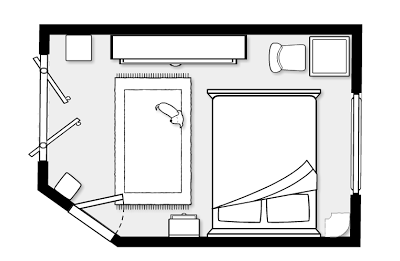 If my room were to be set up differently, I would not have the max amount of space needed to do necessary things. To make things clear for everyone to see, I used the Room Planner on UrbanBarn. The site allows you to plan a room before you attempt to move things around and commit to the design, for free! The blue print style is great for those of you, like me, who want to maximize the space you have. It can be a bedroom or even your living room, the combinations are endless. The Entrance - Is located on the cutoff corner. My room is the only room in the house with this feature. Next to the entrance and to the left, is my skinny bookshelf (the square behind the door). The Closet then follows. I personally wished the closet was located where the bed was because it years past the section where I wanted my bed was always where the closet was built. If my closet were to have been in a different section, the layout of this bedroom would have more potential. The Dresser acts like a focal point when you first step foot into the bedroom. If you would like to see the actual chevron dresser I DIYed, click here! To the right of the dresser is My Desk/Vanity area. Due to the size of my bedroom, I had to compromise and combine two necessary things into one. For more storage, I purchased shelving and placed it above. The Bed itself is a queen size. To the right of it is my Window and a corner unit for bedside storage. Its not apparent on the layout, but there is an air vent right above the corner unit, below the window. This vent is also an obstacle I had to work around. With this set up, I have a great deal of space when I enter the bedroom, as seen by the Rug section. The main purpose of that chunk of space, is for multi-usage. I workout in that section, as well as do homework from time to time, and my dog sleeps there every night.